Former CIA employee Edward Snowden has officially crossed the Russian border at Moscow's Sheremetyevo Airport. Former CIA employee Edward Snowden has been granted temporary asylum in Russia for one year, lawyer Anatoly Kucherena told Interfax on Thursday. "I have given him the certificate granting him temporary asylum in Russia for one year," the lawyer providing legal services to Snowden said. This document allows Snowden to move within Russian freely, Kucherena said. Kucherena did not elaborate on where Snowden went from the transit area of Moscow's Sheremetyevo airport. "I have some ideas but I cannot say, keeping security issues in mind. As of today, he is one of the most wanted people in the world," he said. "I have just accompanied him, he went to a safe place. I hope you will treat this vague information with understanding because he asked that I thank everyone on his behalf and he is really relying on your understanding. The safety issue is a very serious one for him," Kucherena said. Snowden "will choose the place of residence himself - he can either live in a hotel or rent a flat," Kucherena said. "The issues of security, the issues of residence - all of this is within his abilities. He will deal with this himself. I will consult him as his lawyer. As of today, he has to go through a certain rehabilitation course," Kucherena said. Snowden is naturally aware of reporters' interest in him, Kucherena said. "Of course, he will come, he is aware that mass media is interested in him. But in this case, the situation is such for now," he said. Meanwhile, Sheremetyevo spokesperson Anna Zakharenkova told Interfax that Snowden "has received necessary documents and has left the transit area and the airport about two hours ago." "He left by himself, with no company," she said. Meanwhile, WikiLeaks said on Twitter that Snowden left Sheremetyevo Airport in the company of WikiLeaks legal advisor Sarah Harrison. "Edward Snowden was granted temporary asylum in Russia for a year and has now left Moscow airport under the care of WikiLeaks' Sarah Harrison," it said. "We would like to thank the Russian people and all those others who have helped to protect Mr. Snowden. We have won the battle-now the war," it said. It has been reported that the Federal Migration Service issued Snowden with a certificate that allowed him to leave the Sheremetyevo airport's transit area. Shortly thereafter, he left the airport's transit area. Snowden fled to Hong Kong in May 2013 and then released classified information regarding the U.S. special services' online surveillance activities. Following this, Snowden went to Moscow and has been in the transit area of Moscow's Sheremetyevo Airport since June 23. The United States revoked Snowden's passport and is seeking his extradition. 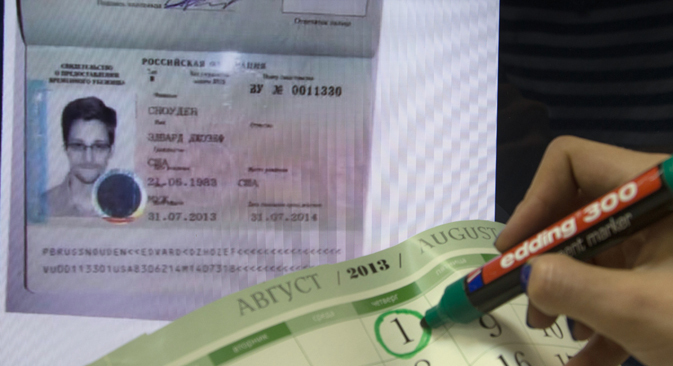 Snowden has officially applied for temporary asylum in Russia. Pavel Durov, the founder of the largest social network in Russia (VKontake), has already invited Snowden to St. Petersburg for work. "Today, Edward Snowden, who exposed the crimes of American secret services against citizens of the world, received temporary asylum in Russia. During such moments, you feel pride for your country and regret for the policy of the U.S. — a country that betrayed the principles it was once built upon," wrote Durov on his personal page in VKontakte. "We invite Edward to St. Petersburg, and we will be happy if he decides to join our star company of programmers at VKontakte. After all, no European company is more popular than VK. I think Edward will be interested in dealing with security issues, to protect the private data of millions of our users," wrote Durov.